The pre-Hispanic cultures domesticated it in the Andean region, yacon (Yacón), is a plant that has potentially interesting attributes to human health, and in the future may represent an important source of income in the rural population of Peru. Only a few years ago this plant root was not given any importance because they believed that its nutritional value was very low, so it was left out the investigations. For these reasons, there is currently very little information on the cultivation, processing technologies. Yacon is a root with a very nice and sweet flavor to the taste, which grows in temperate valleys. It’s a family garden plant that grows with herbs, shrubs and trees on the edge of the fields of corn or yams, vegetables or beans, potatoes, cabbage, parsnips, coffee and fruit. This root is high in Fructooligosacáridos1 Inulin (FOS), which cannot be assimilated by the human body because it lacks the necessary enzymes for metabolism, thus providing a lower level of calories compared with sucrose, being an excellent choice for low-calorie diets and for diabetics. Yacon or Yacón is a 100% Andean plant, its original habitat is the highlands of the Andes, between 1800 and 2800 m, in mountainous temperate climates. Yacon is one of 21 species belonging to the genus Small anthus. It was probably domesticated in the humid regions of Peru and Bolivia from about 1200 BC, Yacon leaves are an excellent hypoglycemic and antioxidant par excellence.These leaves decrease the concentration of glucose in the blood. Today many scientific studies can prove its effectiveness, by which it achieves its effect without producing any alteration in the body. Pre-Hispanic inhabitants of the Tahuantinsuyo, found the Yacón to be an important source of hydration for the human body, so for this reason the root was cultivated during the times of the Incas, alongside corn and potatoes., was a growing establishing the limits of one property to another. 98% of Yacon is slightly sweet water. In local markets yacon is classified as a fruit and is sold along with others like chirimoyas,(paw paw) apples, pineapple, etc. but not with potatoes, oca, ulluco, mashua or arracacha. The storage of the roots of the yacon has a pleasant sweet taste and is usually consumed after a period of drying in the sun. This procedure increases the sweetness of the roots and they are ready when the skin begins to wrinkle. Its consumed by peeling skin, or its mixed with other fruits like banana or orange. 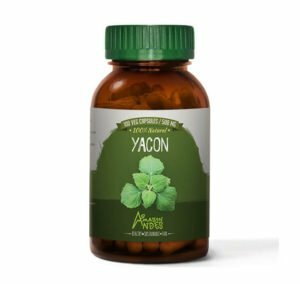 By the presence of phenolic compounds, type chlorogenic acid, caffeic acid, felúrico acid and its derivatives, yacon has antioxidant properties. According to studies this property is due to the ability to increase insulin levels. • Provides antioxidant effect. • Provides a protective effect of the liver. • Helps improve your digestion. •. Generally improves the functioning of the immune system. • Stimulate the growth of intestinal flora (prebiotic). • Are free of calories, so they are recommended in diets for weight control. • Increase the absorption of calcium and magnesium. • Facilitate intestinal motility (it is recommended for people with constipation). Its use is not recommended during pregnancy or lactation, or for people with hypoglycemia. No significant side effects in the yacon root supplements to the FOS 0.14gr per kg body weight. 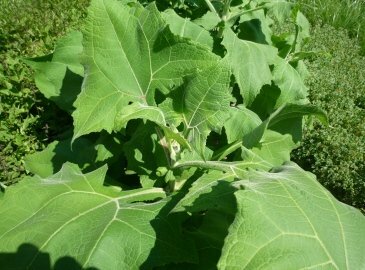 The yacon extract should be avoided if you suffer from frequent diarrhea, loose stools or if allergic to other related yacon plants such as sunflower seed products. This supplement is caffeine free, suitable for vegetarians and contains no genetically modified ingredients. In adults it is recommended to consume an average of 15 g per day of yacon powder root (about 1 ½ tablespoons), mixed with juices, yogurt, smoothies, etc. In children 5 g recommend a teaspoon a day accompanying their juices, desserts or drinks. Yacon micro pulverized leaves can be consumed x 500 mg capsules dose ranges from 1500 to 2000 mg / day. However, yacon, being considered a nutraceutical, does not require a prescription, and the demonstrated safety of yacon root in leaves and the ease of use. Still to be developed in clinical studies, to better standardize the extraction techniques, for the preparation of the final product, and the optimum dosage, to achieve the best desired effect. The Yacon has different presentations according to their different processes, but has proven effective in each use. Yacón chips: Can be oriented as a consumer market appetizers or snack, it has a nice flavor, similar to a dried apple. Yacon Syrup: It can be a substitute for similar calorie sweeteners, with the advantage of being a product with nutraceuticals properties, . Among the various uses and applications of yacon syrup, one can mention its potential use in the following industries: juices, yogurts, dairy, bakery, infant formulas, and cereals, biscuits, in confectionery, cakes and desserts. Yacon Tea: was invented in Japan. Consumption of the infusion for the treatment of diabetes is recommended, although there is no scientific evidence of its effect in humans.